Fruit from the bush tomato plant Solanum ossicruentum bears little resemblance to its cultivated cousins, sciencenews.org reported.The Australian tomato, about a couple centimeters wide, grows enclosed in a shell of spikes. These burrs probably help the fruit latch on to the fur of passing mammals, which then spread the tomato’s seeds elsewhere, researchers at Bucknell University in Lewisburg. Slice open the fearsome fruit and within five minutes, its sticky white-green flesh appears to bleed, flushing bright red to dark maroon in response to air exposure. One brave researcher tasted an unripe fruit and deemed it salty. The bush tomato becomes no more appetizing with time: Mature fruits harden into dry, bony nuggets. 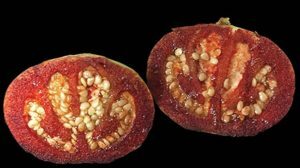 The tomato’s gruesome qualities inspired its name, courtesy of a group of Pennsylvanian seventh-grade science students: ‘Ossicruentum’ combines the Latin words for ‘bone’ and ‘bloody’. 1.Few Countries that have advanced researched facilities on fruits and vegetables longer shelf life. There are over millions of bio-engineers in the world. What likely to be the effect of prevalent fruits and vegetables diseases to these biotechnology facilities? 1.1 Can you name other food and vegetable research facilities? 2.What countries are affected by failed bio-engineered fruits and vegetables? 3.What preventive policies should the government do? 4.1 Can you name other fruits and vegetables that possibly be hit by bio-engineering espionage?